2006 began with 3 days of DEVO in Agoura Hills. I attended all 3 shows, and everyone seemed to have a very good time at The Canyon Club. I arrived in Los Angeles on the afternoon of Thursday, Jan. 12th, and proceeded almost immediately to DEVO's rehearsal at SIR Studios in Hollywood. (see photos below). See images below of flyers, local press, etc. The Canyon Club is located about 30 miles North of Los Angeles, and proved to be a great place to hang out for 3 days. The staff was extremely nice & accommodating, and made sure that everything went smoothly for the band & crew. Ray Amico, DEVO's tour manager during their 2005 shows, flew to CA to help with their first shows in 2006. 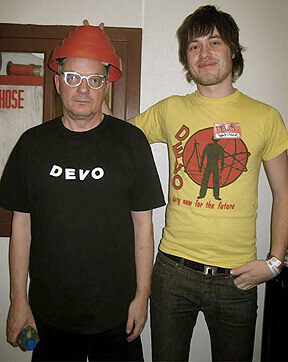 Fans came from all over the world to see DEVO in action. Andreas Bakkemo made the trek all the way from Norway! Click on the thumbnail images on this page to get details from each night. All 3 shows were fantastic. The most memorable moments include Bob1 playing his guitar solo during "Smart Patrol/Mr. DNA" on top of the tables of unsuspecting dinner guests (just like in 1977!). There were many notable faces in the crowd: Todd Rundgren, Terri Nunn of Berlin, Doug Fieger of The Knack, Elliot Easton and Greg Hawkes of The Cars, and Sting. Bob "Bob 2" Casale and his wife Lisa were kind enough to invite Ray and I to their home on Monday night to enjoy some of his excellent home cooking. If you didn't know already, Bob 2 is a fantastic cook...and really knows how to work the oven & grill at the same time. Thanks, Bob!! Webmaster & Archivist - DEVO, Inc.